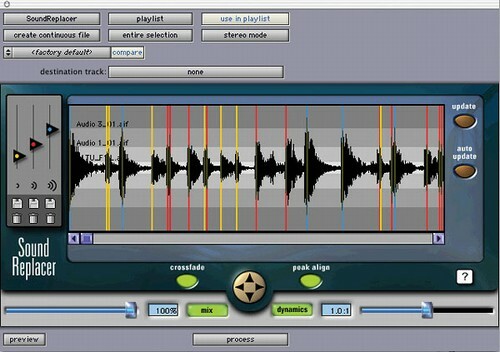 SoundReplacer is a truly unique AudioSuite plug-in that allows you to replace or mix an audio event with new samples from your sound library or hard drive. It is the perfect solution for that all-too-familiar situation of the imperfect drum track. SoundReplacer allows you to retain the feel of the original performance by automatically adjusting the dynamics of the replacement sound to match the changing levels within the performance. What's more, SoundReplacer lets you replace or blend up to three different samples to three different adjustable amplitude threshold zones in the audio file. Variations in amplitude within the performance determine which sample is triggered at a given time. Performances can be further adjusted with a mix slider, dynamics slider, and a peak align feature. Although SoundReplacer is perfect for repairing weak mixes, it also has enormous creative potential for sound design and post production applications. Sound effects designers can morph three different characteristics to a single source file, thereby adding a sense of realism to an audio track.